Tender Himalayan Ipecac is a very slender twining perennial herb which is much branched, hairless or velvety. Leaves are 2.5-10 cm long, 2.5-12 mm broad, linear or narrowly lanceolate, blunt, pointed or long-pointed. Base is rounded, and the leaves are hairless on both the sides with hairs on the nerves. Leaf-stalk is 2-5 mm long, minutely hairy. Flowers are borne in 2-4 flowered stalked cymes. The stalk of the cluster is longer or shorter than the leaves. 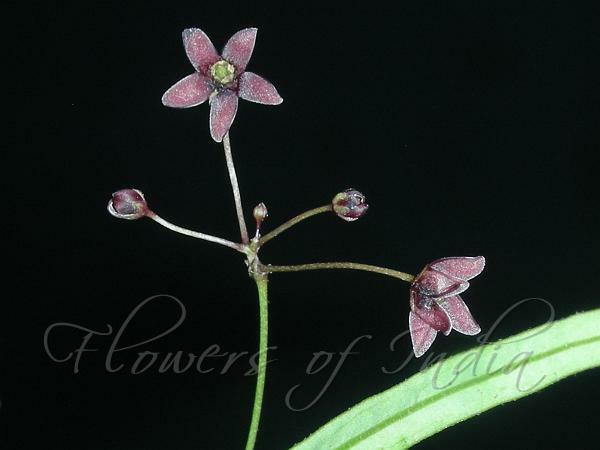 Flower-stalk is 4-13 mm. Bracts are about 1-1.5 mm long, almost hairless. Sepal cup is 1.2-1.3 cm long, sepals ovate- lanceshaped, hairy. Flowers are purple, 8-9 mm in diameter, lobes linear- oblong, puberulous within, corona-scales are longer than the stamen-tube, tip pointed, incurved. Pollen masses are horizontal. Seed-pod is 8-8.5 cm x 3.5 mm, tapering towards the tip, hairless, channeled. 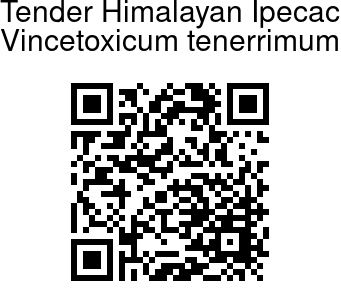 Tender Himalayan Ipecac is found in the Himalayas, from Punjab to Bhutan, at altitudes of 2000-2500 m. Flowering: June-October.